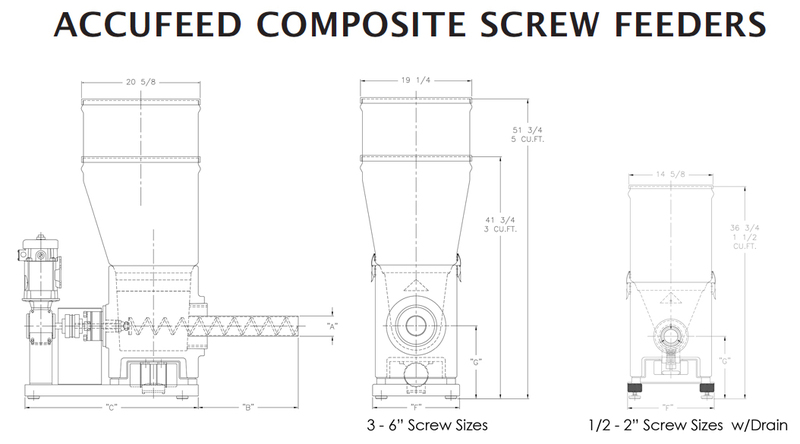 AccuFeed Screw Feeders offer significantly reduced cost and off-the-shelf delivery in a design that delivers unsurpassed feed accuracy and dependability with rates up to 600 cubic feet per hour. These high technology feeders use composite materials of construction in molded components for extreme strength and durability. Contact parts are polyethylene and stainless steel for excellent chemical resistance. Materials meet FDA requirements, and the design is USDA approved. Sizes: (Inches): 3/4, 1, 1 1/2, 2, 3, 4, 6.